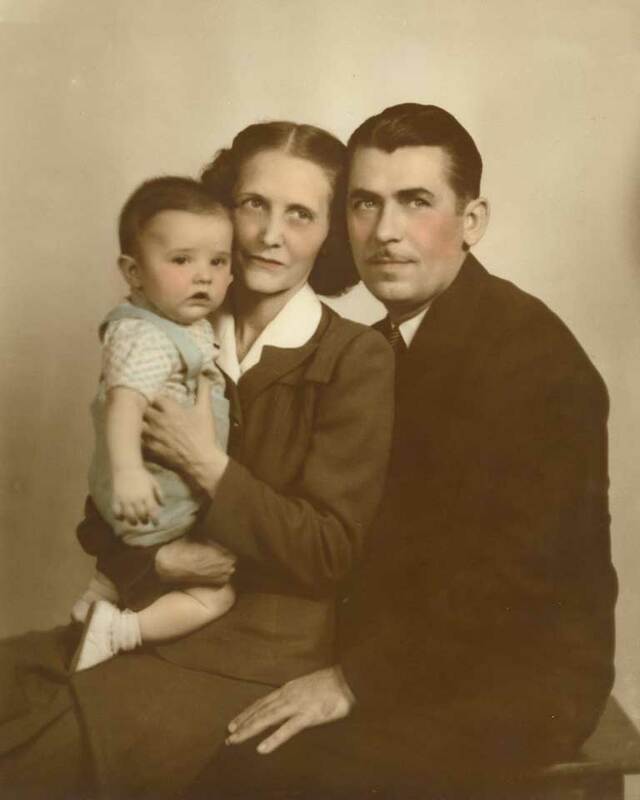 Richard Hill as a child with his adoptive parents, Harold and Thelma Hill. Richard Hill spent his career working in the sciences and in marketing, but hearing about his decades-long search for family you get the sense he would have made a great detective. While shoe leather helped him unravel much of the mystery of his birth, it wasn’t until the availability of personal genetic testing, including testing through 23andMe, that Richard completed the picture of his biological family. “My search had lurched ahead and stalled repeatedly over 31 years,” he says in a book he wrote about his quest Finding Family: My Search for Roots and Secrets in My DNA. The gap in Richard’s history became apparent when he was 18. That’s when his doctor looked through his medical file and let slip that Richard had been adopted. He was stunned. “My heart skipped a beat,” Richard said in his book. Thus begins Richard’s saga, which is part memoir, part detective story. It details his search for family, and how after decades of using paper records and tracking down whoever knew any tidbit of information that could help, Richard finally turned to DNA testing from 23andMe and other services. These tests helped him identify first his late biological father’s surname and later confirmed his exact place in his large biological family. His search wasn’t fueled by a sense of abandonment. Richard knew his parents loved him, and he in turn loved them. Whenever someone asks him about finding his “real” parents, Richard corrects them, saying his real parents were the couple who adopted him. But the search and the answers he found on the way helped him fill in missing pieces of his history. His father went on to reveal the first bits of information Richard had ever heard about his biological mother. She was “a cute little Irish girl” and her name was “Jackie.” He added one more fascinating piece: that she had had another son. So Richard learned that somewhere out there he had a brother. His father suggested that Richard should find him. Not everyone’s family story is cloaked in mystery like Richard Hill’s. Most of us just want to learn a little more about our history and gain insight into the generations from which we descended. 23andMe’s Ancestry tools can help you explore what your genetics says about your ancestry. Some of the insights can only be had through genetics. When used with other information – whether it’s your family’s oral traditions, names of ancestors in a family Bible, or other paper records – your 23andMe results can become even more powerful. When Richard started looking, he almost immediately faced daunting obstacles and dead ends. For instance, although he found the identity of his biological mother, he quickly learned that she’d died a little over a year after his birth. With a lot of work and luck, he was able to connect with her son, his half-brother. The two met for the first time in 1981. But finding Richard’s biological father seemed impossible: He had no name – the one on his original birth certificate was the name of his birth mother’s ex-husband. In addition, his mother never told anyone who fathered her second child. The pregnancy itself was a secret and she had left town for the delivery. Still, none of that stopped Richard from searching. He did this by painstakingly piecing together his mother’s life at the time of his conception in 1945, and then contacting people who knew her or worked with her at the time and were still alive. It took years. At one point he thought he’d found his birth father only to learn, after a paternity test, that he was wrong. That didn’t stop him either. Finally, with the advent of early genetic tests that traced Y-DNA, the paternal line, Richard matched a distant cousin whose surname might also be that of his father. That provided a vital clue. He went back to some of the records he’d accumulated in his search. His mother had worked at a bar called Dann’s Tavern. Looking at old records he noticed that the name of the bar’s owner matched the surname he’d dug up. Although the bar was long gone, and its owner dead and buried, Richard was able to find a niece of the man. He learned the owner was one of five brothers, and all of them were now deceased. So Richard started contacting sons of each man, asking if they would agree to a DNA test to determine if they were siblings. But unlike 23andMe’s test that now reads more than a million points in your genome, the only test available then looked at just 15 genetic markers to estimate family relationships. That test led him to identify the wrong man as his father and the wrong children as his siblings. It took a few more years, and a test by 23andMe and a test by FTDNA, to figure out that he’d made the mistake. The two tools he used to correct the mistake were 23andMe’s Relative Finder and FTDNA’s Family Finder. The first test was on a man he thought was a cousin, but after getting the results back from 23andMe, it was clear that this man was actually his half brother. “DNA testing helped me and it can help others,” Richard said. His years of searching and his use of DNA testing has also made him a go-to source for others turning to genetic testing for more answers about their ancestry. He set up a website, www.dna-testing-adviser.com, to help people make sense of the different tools out there. And even with the ups and downs of his family search, he doesn’t regret a thing.